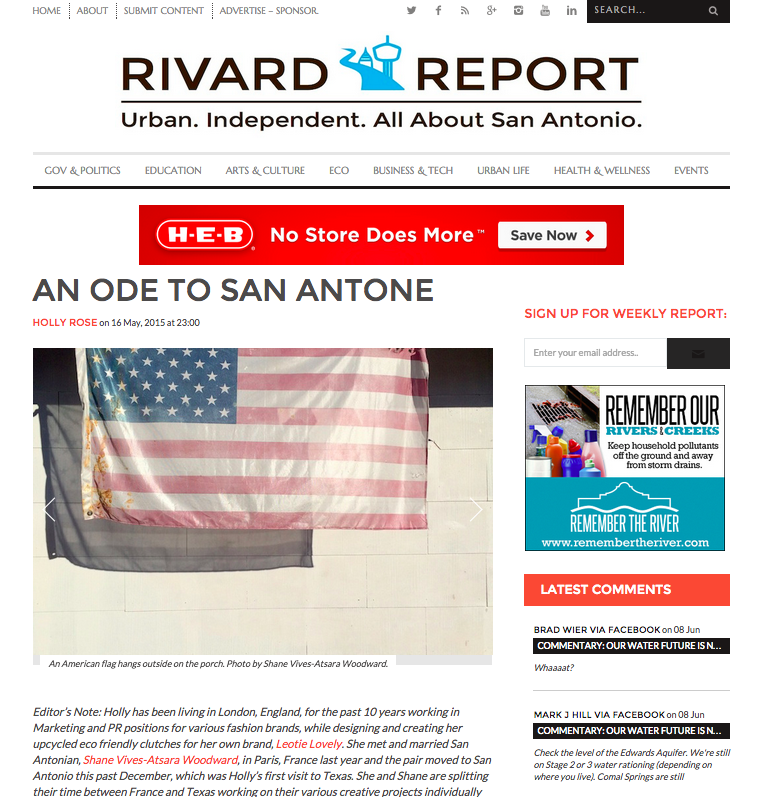 The Rivard Report, a publication based in San Antonio, Texas published a creative writing piece I wrote based on my reflections and experiences living in San Antone. San Antonio shares its secrets slowly. Coyly, it awaits resolve to dissolve in the eyes of foreign strangers, who, satiated by Europe’s absorbent allure and tainted by tall tales of Texas, arrive delicately dozy to its distinctive delights. Culture shock, like most responses to change, creates a personal cage within which allows only what’s ‘wrong’ to penetrate its walls. Trips to and from franchised establishments compound the feeling of claustrophobia and that congestion creates corruption, constantly comparing the incomparable until the soul of the city, dressed in a slow smile and winking with wisdomful eyes, lays itself down on your doorstep like an Arabian magic carpet and offers you a ride. This discretely mystical place unveils itself with leisure; it wants to be discovered not devoured. With a shy grin it disrobes; layer upon layer, depth hidden behind tradition, gems glowing beneath the dust of abandoned cars and radiating from hearts which shine through the shadows strewn behind the few heat packing pockets that cross your path. Simplicity and community are key here, ask and it shall be given, shine and supportive waves will wash over you, goldfish grow grandly with room to stretch and explore. Gratitude, through love of God, country or humanity reigns with the strength of the bovine beasts who decorate this city. Despite expectations of competition it’s courage that flourishes forth; “there ain’t no ‘I’ in team!” you hear hollered from the bleachers and the crowd roars with unanimous support. Family expands beyond blood, language beyond words; old values aid new growth breathing new breath into the beyond. As you peel the rind off the ample fruits which line these sunkissed streets, open arms rise up to embrace you, welcoming you with that legendary southern charm and as your mouth rings rich with the tastes of harmonizing cultures, your eyes fly open revealing the spirited tranquility which runs wild through the streets. Like a dormant volcano the city explodes with a rainbow of virtues, lighting up the sky like fireworks on The fourth of July, and you see, with glee and vulnerability, what a balanced blend of brotherhood is bred here.